The Manchu encouraged the spread of Tibetan Buddhism across Mongolia, using it as a tool against the Mongolian ruling class. The Manchurian ministries exploited the Mongolian population by imposing harsh military and civil services as well as agricultural taxes. They also terrorized the population with punishments in cases of disobedience. Meanwhile, from the capital city of Ih Huree, the Buddhist leader of Mongolia imposed his religious rule by recruiting young males for his monasteries and levying numerous taxes for religious ceremonies. Thus, the Mongolian nomads toiled under the dual oppression of foreign and domestic religious rules. 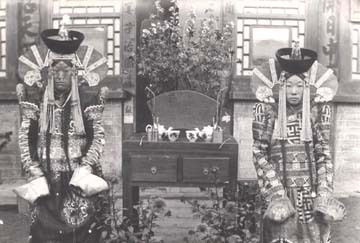 Mongolian (Halh) princesses photographed in an Ih Huree studio ca. 1910, courtesy of the National Museum of Mongolian History. "The Mongolians often rebelled against their Manchu rulers." · At the top were the Manchu emperor and his administrators, located in Mongolia and China. · Genghis Khan's descendants, the princes (noyon) and noblemen (taij) formed the Mongolian class of overlords, about 6% of the male population. · Serfs, 17% of Mongolian males, served various masters - Manchu rulers, Mongolian overlords, and Buddhist lamas. Serfs paid taxes and provided free labor for one or more of these overlords. These services ranged from military duty to farming, herding, or housekeeping. · Between the overlords and serfs was the commoner, or free class - herders, merchants, and public servants who ranged from poor to wealthy. Representing 27% of the male population, they owed fealty to no one but they did pay taxes. The lamas were also organized into a hierarchy from the chief lama in Ih Huree, the Javzandamba, and high reincarnated lamas who owned many serfs to poor lamas who worked as clerks for the lamas of higher rank. 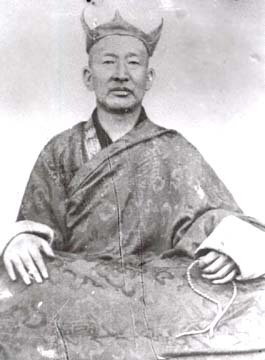 The high lama Manchir of Tusheet Khan Aimag. He later protested against the Chinese occupation of Mongolia (1919-21). Photo courtesy of the National Museum of Mongolian History. While those at the top levels of society (religious and secular) lived very well, the commoners and serfs were impoverished by double or even triple taxation. The serfs also had to take time from their own work to perform free labor for their overlords. The Mongolians often rebelled against their Manchu rulers. The largest revolt prior to the 20th century was led by Princes Amarsanaa and Chingunjav (1755-1758). * In the beginning of the 20th century, Ayuush led multiple revolts in the western province of Hovd.